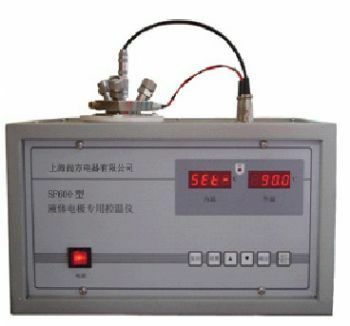 This device is specially designed to control temperature for insulation oil measuring electrode. It could be used together with universal cylinder insulation oil electrode. This device ensures that the insulation oil will get a required temperature and keep at this temperature for long. Thus tgδ and εr could be measured through high voltage electrical bridge. The device display simultaneously inner and outer temperature. Heating control is realized by inner and outer heaters through two single chip computers. PID fuzzy logic control could totally eliminate influence from grid voltage and ambient temperature. It is featured by small error and fast heating. Setting temperature is input with nominal keyboard, making the error zero. Input and output are optically isolated. The device also has hardware wiring self-inspection function, ensuring reliable working.